Heart Shaped Knot Sterling Silver Pendant Necklace, "With Love"
Symbolic of the ultimate bond, a heart-shaped knot centers this romantic pendant necklace from Thai artisan Aoy. The necklace is crafted from sterling silver and features a cable link chain. 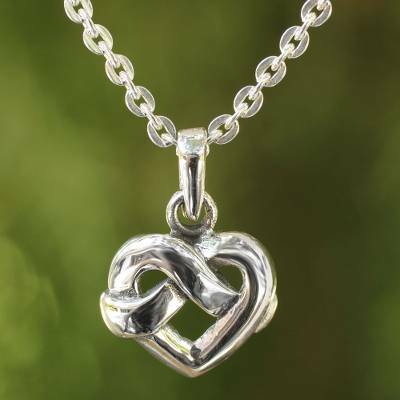 You can find sterling silver pendant necklace 'With Love' by Aoy in jewelry categories such as Heart Shaped Necklaces, No Stone Necklaces, Silver Necklaces, Sterling Silver Necklaces and Pendant Necklaces. Enjoy exploring these sections for other Novica treasures. Love Knot Pendant Lovely Knot Loving Romantic Jewelry Nice Necklace!